Line a rimmed baking sheet with parchment paper and spray lightly with non-stick spray. Spread air popped popcorn onto baking sheet and set aside. 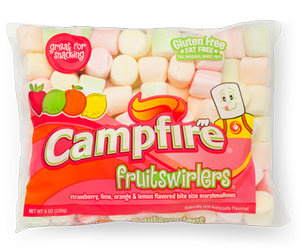 Divide Campfire® Fruit Swirler marshmallows by color into 4 medium size, microwave safe bowls. Add 1 Tablespoon of butter to each bowl. Working with one bowl at a time, microwave marshmallows and butter for 25 seconds, watching closely. Stir and repeat if necessary until marshmallows and butter are fully melted. 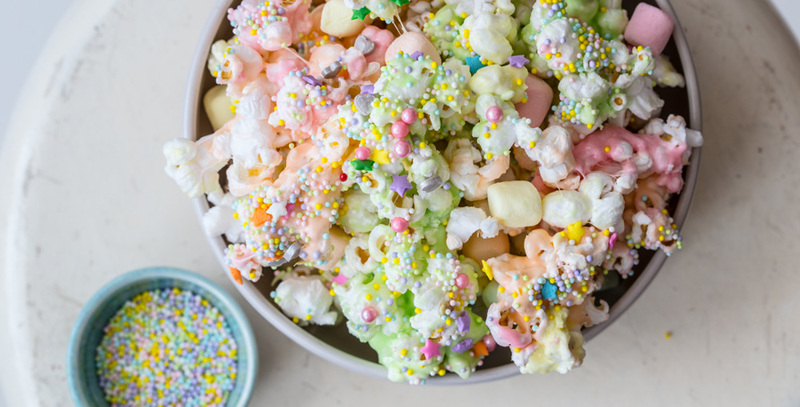 Pour one color of melted marshmallow over 1/4 of the popped corn. Use a rubber spatula (or hands) to toss popcorn in marshmallow mixture. Repeat with remaining melted marshmallows and remaining corn. Try to keep colors separate for rainbow effect. 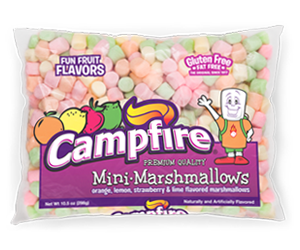 Sprinkle marshmallow popcorn with sprinkles and mini fruit marshmallows. Allow to set until cooled. Separate marshmallow popcorn into pieces and enjoy!